Himalayan rock Salt Crystal Lamps have a similar effect to an ionizer. These Himalayan salt lamps emit negative Ions to their surroundings. Negative ions kill bacteria, purify the air, reduce radiation, increase well being & soothe the mind, body & soul. Negative ions are found naturally in nature, before Thunder Storms, at Waterfalls and wherever Nature is most pure. 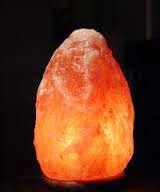 Himalayan Rock Salt Lamp has healing ability. Millions of years ago, continents collided raising ocean beds high into the mountains of the Himalayas. The salt from those beds still remains deep inside the mountains. Himalayan Rock Crystal Salt Lamps are made up from salt that originated from oceans millions of years old, which were free from any man made contaminants. Himalayan natural rock salt is actually Ancient Sea Salt. Now-a-days, Computers and Electronic Items have become a must in our lives, along with which we are prone to health illness like depression, fatigue, insomnia, nausea, tiredness etc. This Lamp beside you can make you alert and feel happy to work all the time. Ladies suffering from smokers at home ( like husband loves to smoke but the wife hates the smell) for such people this would solve the problems. For children who need concentration can keep this lamp beside them for high concentration results. Benefits Salt Rock Crystal Lamps create an environment rich in negative ions that has a wonderfully positive effect on your physical, emotional, mental, and even spiritual health. · Reduces the severity of asthma attacks. · Boosts Serotonin levels in the bloodstream. · Speeds recovery in burn patients. · Aids relief from sinus problems. · Improves learning and alertness. · Increase work productivity and concentration. · Reduces susceptibility to colds and flu.